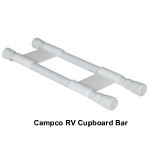 Most die hard campers have heard at least one horror story of something spilling all over the fridge in their RV while on the road and have either a huge mess to clean up or have even had it cause damage to the fridge itself. Transporting liquids, especially containers that have been opened or are breakable can be tricky especially if the roads you're traveling over are full of potholes and bumps. Eggs can be another problematic food to transport. Long Foam Swimming Noodles - Yes those long brightly colored foam noodles you see all over the stores in the summer for just a couple of bucks can help keep your food in place. Cut them up into smaller pieces and wedge them between your food containers to keep them in place. Glad Press and Seal - Wrap your containers in plastic wrap to prevent leakage and spillage. That way if a cover comes loose or if a glass jar of pickles breaks the mess is confined inside the plastic wrap. Plastic food storage bags work well too, but I like the Press and Seal because it tightly adheres to any size or shape container. I use the Press and Seal when I'm transporting food in coolers too. Plastic Storage Containers - Use something with solid sides and bottoms such as plastic dishpans or other plastic storage containers found in the plastics aisle of your local discount store. Put your jars and bottles inside the container and then into the fridge. If something does leak or break, the mess is contained and you only have to clean up that one container instead of the entire fridge.